Less is more: How are you?.... Oh just fine........Really?!!!!!!! How are you?.... Oh just fine........Really?!!!!!!! “You can paper things over for a while but eventually you have to face reality.” Stiglitz told the nationally syndicated Alex Jones show yesterday. 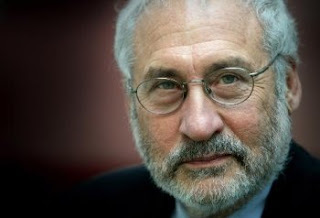 “This is clearly the most serious problem since the great depression and in some ways worse in terms of the financial institutions.” Stiglitz commented, referring to the fact that lenders are unwilling to take risks to finance each other because they no longer have complete access to their own undertakings let alone those of other institutions. “It is particularly bad because our financial institutions are based on trust, you put the money in the bank and you trust that you can get your money out, so trust is absolutely essential for the functioning of our financial markets and the functioning of our economy.” he continued. Describing the current situation as a “top down crisis”, Stiglitz also cited the $3 trillion cost of the Iraq war as a key factor in the economic downturn, saying it has increased the budget deficit and consumed resources that would otherwise promote growth. “This is the first war in American history that has been totally financed on the credit card… For the last five years as the war has gone on we have been a debt economy. It is the first war since the revolutionary war that we have had to turn to foreigners to finance, 40% of our national debt is now being financed by foreigners… Even as we went into the war we had a big deficit, and yet the president called for tax cuts for upper middle class Americans.” he said. “It is clear that the Bush administration is not responding to these problems, partly because the problems are of their own making.” Stiglitz asserted. In a long term prediction 22 months ago, Stiglitz told listeners of the Alex Jones show that he believed a global economic crash would occur within 2 years. With major financial institutions now folding every week, others touting mergers just to stay afloat and stocks continually plummeting on a daily basis it seems that prediction is coming to pass. Stiglitz stressed that in order to emerge from the crisis, the economy needs a stimulus, that really works, consisting of increased aid for local government, stronger unemployment insurance and more investment in infrastructure. “I would take advantage of this particular time in order to stimulate our economy in ways that provide the basis of our longer term economic growth. If our economy is growing then we will be better able to manage some of this financial turmoil.” he concluded. I follow this guy myself. He's a smart cookie so if you don't already, I suggest you keep tracking what he says. The social dimensions to this crisis by the way have not even begun to kick in yet despite the protests in Ireland today and other places, it will become far far worse than many realise. Regards and all the best and take care. Yes Rug...we are just at the beginning I think. I will follow him on your recommendation - I ran across him here just in reading. Interesting and tragic times we live in. We shall see now the stuff of which revolutionary consciousness is made; or not. But it will not be carried by the mainstream media when people do arise - we shall have to blog them to success as they occur I think. Thankx for your comment - appreciated and inspiring as always.